Ok, I collected data from 2 polls (effortlessenglishpage.com, effortlessenglish.pl). Let's see the result of your votes. 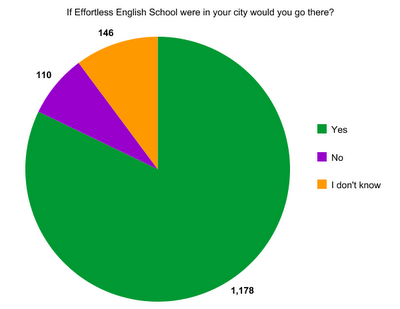 The question was "If Effortless English School were in your city would you go there?". Together we have 1 434 votes. Yes - 1 178 - that's 82%, nice! What country? What city? Please write in comments! Germany, all german people have to learn it at school, university, etc. and the way they learn isn't really helpfull!!! hi everybody, Aj Hoge really loves teaching I wish there were lots teachers like him. Do not worry guys he gives us nice tips to improve our language skills. I wanna meet Aj but he is very busy.I wish I could meet him. I thank you Aj because you want everybody to master the English language. I'd like to use your method in my language school, what do I need to do? It's a nice idea that you wanna use AJ Hoge's method of teaching English in your language school.Of course you need permission of the method's inventor.Once you have it - FREE or any kind of agreement you need to go through to achieve it,hurry up and start teaching ! I wish you a great success. Austria! I would love to go there. I have already bought a set of your stories and they really help me improving my English skills. in indonesia please.... students need effortlessenglish here, I want everybody here konws about effortlessenglish.. and try ur methods..I wait u here. I wanna share effortless english here..
His English method would be useful in Spain. All the best. VietNam - HoChiminh City (Hieu Nguyen).I hope so. You emerge like an angel! Love from Bangladesh. I am going to buy the Power English shortly. If you ever think to open an institute in Bangladesh I am here to help. Even I can invest if it is mutually beneficiary. Please find a way how to operate.